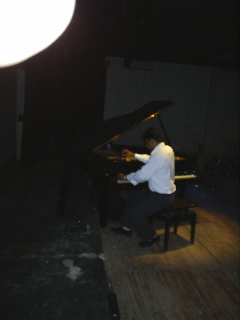 After the recital in Poona, September 21, people were anxious to see some of the scores, came on stage and took photographs. The Mazda Hall is a large hall with the beautiful Blüthner of the Poona Music Society. Monique performed the recital utilizing only the poetry. 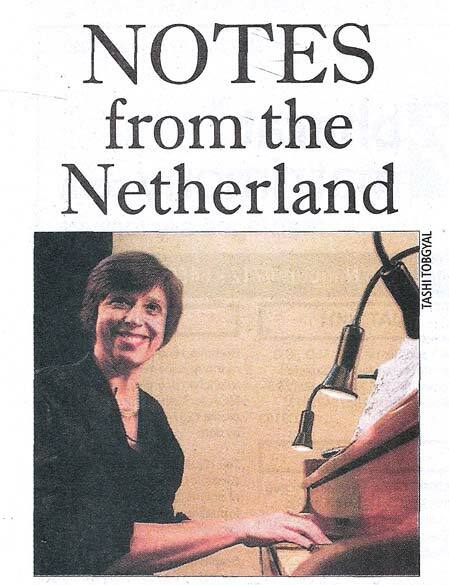 ....Dutch pianist Monique Copper, lends romantic lyrism to water......"
"......She once again hypnotised and mesmerised Bangalorians through her performance on wednesday. 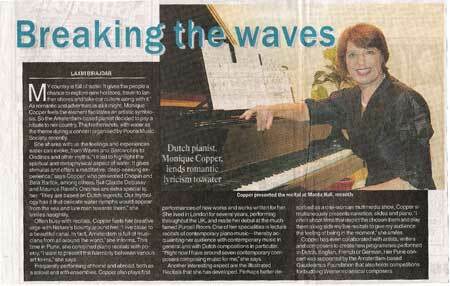 The Dutch pianist Monique Copper presented 'Water', a programme organised by the International Music & Arts Society. .....Images of various forms of water rippling in the background merged with soft tunes........."
The performance with video on DVD, CD player and voice amplification for the narration demanded extra equipment and work for the organizers. The submitted super-perfect-technical-scheme was understandably interpreted as very complicated. The intention was to give an idea of how one could set it up with the means available. Fortunately, upon arrival the technicians improvised as much as they could under the supervision and professional guidance of Monique's husband Frans ter Horst. 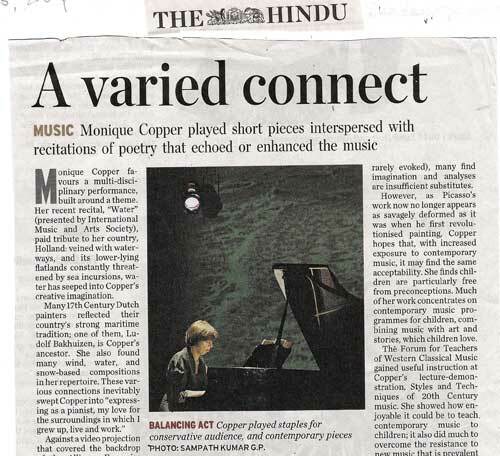 THE DELHI MUSIC SOCIETY presents MONIQUE COPPER in 'W A T E R' in The India international Centre, New Delhi. 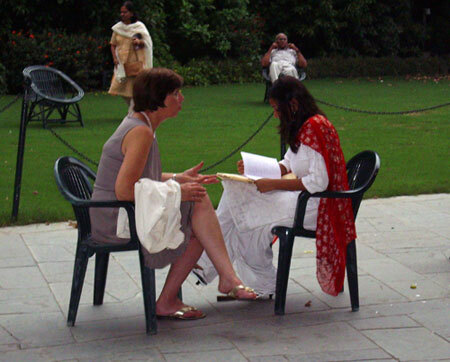 The Delhi Music Society has been awarded by the Polish Ministry of Culture for their efforts in promoting Western Classical Music in New Delhi, India, and in particular for the Polish Culture. The reward was presented in Warsaw, Poland September 23rd 2007 by the Polish Ministry. Congratulations! "People asked me if I was sitting kind of in the water, when I played in front of the video projection - the water composition. A great success. The piano was positioned in front of the video projection indeed, the result was incredible!" 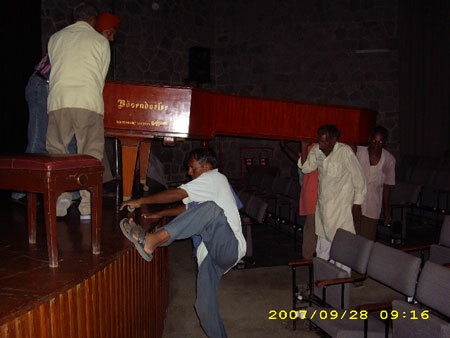 The Black Box of the Kala Academy Goa was almost completely full with a very young audience. The famous writer and critic Professor Leslie Menezes from Goa was so inspired to write a whole article of 800 words with aquatic and liquid expressions! 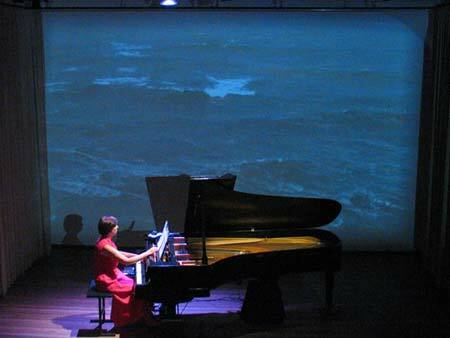 "Her fingers ran all over the very responsive keys of the baby grand piano at the Kala Academy on 17 October, now swishing a shimmer of sound, sometimes chasing a wave across the keyboard, now plunging deep into the depths to surface a threatening tsunami, or riding brightly on the gentle surf. The many faces and voices of water flowed into a very receptive audience, who were refreshed by the unique approach of Monique Copper, the Dutch pianist visiting Goa........"
"..When she surfed the 21rst Century, we were riding the waves with her blissfully letting the wash of notes and poetry immersed us in a new imaginative world. Many audiences erect dams to shut off the on-rush of new music but our Goan audience showed its creative sophistication by opening the sluice gates and letting these unfamiliar compositions sweep them to a fresh new experience. Monique commented on this encouraging response to her music in Goa: "We must be children again to listen again. Old music was new in the old days. Chopin's music was "new" to his audience but for us it's recognisable, familiar. With new music in the programme, your attitude to music changes: it sharpens your listening because you are visiting new areas". 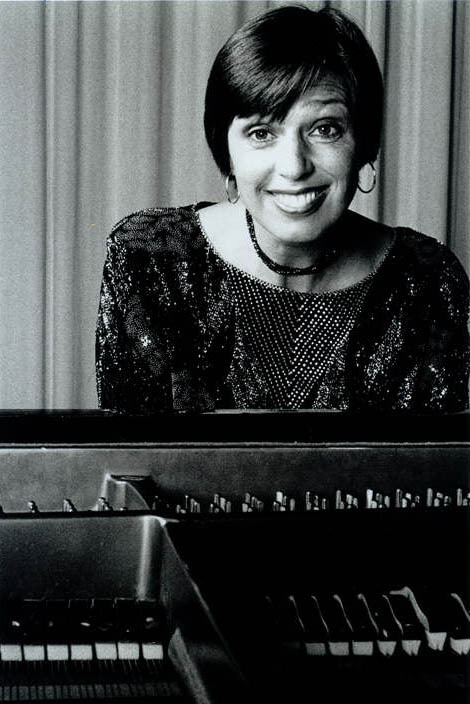 We must thank Monique Copper and Pro Musica for bringing this enriching experience to our watery shores and making it possible for us to dive in and go away refreshed by the new music."